At 165 metres high with a 45-degree angle, the Montréal Tower is the tallest inclined tower in the world. It is an architectural masterpiece, and the secret to its extraordinary tilt can be found in its complex internal structure. The glass-encased funicular brings visitors on a breathtaking two-minute ride to the top of the Tower. This one-of-a-kind funicular can hold up to 50 passengers and is the only one in the world built along a curved structure. The view of Montréal from the Tower’s Observatory is stunning in any season. See Montréal from the top of the tallest inclined tower in the world. Any time of day, the Tower Observatory’s 360º panorama offers spectacular views—up to 80 kilometers on clear days. The renowned Michelin Guide has awarded this incredible panorama three stars, which is the highest available rating. From the top, you can see the Stadium, the building that once housed the Velodrome (now the Biodôme), and the Esplanade, as well as all their incredible architecture. This point of view provides a look at the organic forms inspired by aquatic wildlife that make up the Olympic Park. Discover this iconic site as well as its unique architecture. Our guides will tell you all about the Stadium’s history and share surprising stories about this Montréal icon. There’s something for everyone—from architecture to sports, culture and, more! 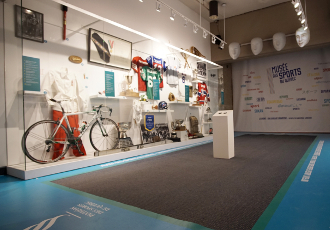 The Since 1976 exhibition will take you on a journey to rediscover the history of the Olympic Park, from its construction to today. It features a number of artefacts, as well as photos, video archives, and interactive digital content, and also looks at different aspects of the site, from professional sports to architecture and cultural events that were held here. 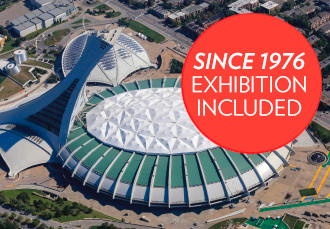 Located in the Montréal Tower, the exhibition provides a closer look at different aspects of the Olympic Park’s history. Come relive the Olympic Park’s greatest moments! 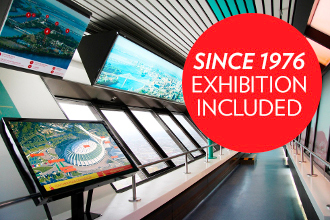 Since 1976 exhibition is included with the Observatory and the Olympic Stadium guided tour. 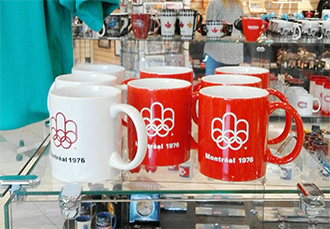 The Olympic Park has two souvenir shops: one at the summit, and one open in high season, located in the Tourist Hall at the foot of the Montréal Tower. Our souvenir shops offer a variety of products, including postcards, t-shirts, and stuffed toys, as well as a selection of items exclusive to the Olympic Park, such as models of the Stadium. The Montréal Tower funicular is the only one in the world that operates on a curved structure. Its hydraulic system allows the cabin to remain horizontal. P5 underground parking located at 3200 Viau street. Bike access via bike paths located on Rachel street, Maisonneuve Park and Bennett street. Bike racks are available just steps from the Centre’s entrance. There’s also a Bixi station on Pierre-de-Coubertin avenue. A 5-minute walk from Viau metro station (green line) as well as stops for buses 34, 125 and 136. The Montréal Tower is accessible to people with reduced mobility, and sanitary facilities have been adapted to accommodate anyone who uses a wheelchair.